I was looking for some scrapbooking ideas when I came across this article by Carmen Chapman. Her twelve year old son is battling with blood cancer. Instead of being beaten down by this fatal disease, this young guy has taken upon himself to make life easier for kids like him. 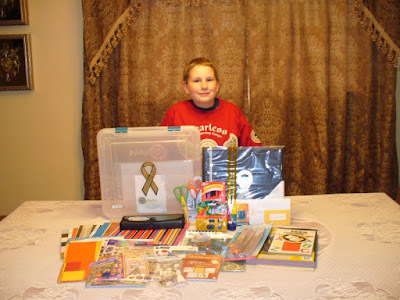 He makes scrapbooking kits for children suffering from cancer and distribute them in cancer wards. Each kit costs around $60.It is a very commendable effort, and we should help the kid. You can donate through paypal when you visit the site http://www.scrappingwithcancer.org/ or spread the word by linking to brody's site.